In a Monday night affair where defense reigned over underwhelming offenses, the better defense ultimately took home victory. Forcing Chicago Bears rookie quarterback Mitch Trubisky into two turnovers in his NFL debut, the Minnesota Vikings‘ defense did just enough to pick up the 20-17 win and improve to 3-2 on the season. Without a successful ground attack, Trubisky couldn’t lift the Bears’ offense too far off the ground, as he completed just 12 of his 25 passes for 128 yards and one touchdown against one interception. With the game tied at 17-17, Vikings star safety Harrison Smith intercepted Trubisky late in the fourth quarter to set kicker Kai Forbath up for the game-winning field goal. While the Vikings offense struggled mightily, the play of McKinnon was encouraging after losing star rookie Dalvin Cook to injury. McKinnon gained 39 of his 95 yards after contact and made some big plays to pick up important yardage for the Vikings offense. He also came up huge in the passing game, catching all six targets he saw for 51 yards and an impressive average of 2.13 yards per pass route run. While Remmers was the main culprit, the Vikings entire offensive line struggled mightily in this game. Both Sam Bradford and Case Keenum found themselves constantly worried about pressure, as the offensive line surrendered three sacks, four hits and four hurries. Remmers allowed two of those hits and a hurry but was also beaten a couple other times with no pressure recorded. They were equally bad in the run game, with all five starters grading below 44.2 in run blocking. If you take away McKinnon’s big touchdown run, the Vikings running backs were averaging a measly 0.82 yards before contact. Smith’s team high grade of 90.2 was earned in a variety of ways. He played an important role in the run game, recording a grade of 80.4 in that department, with two run stops to his name tonight. His interception of Trubisky late in the fourth quarter was the icing on the cake of an already stellar coverage night. Smith was targeted four times in coverage, allowing only one reception for negative yardage. Hunter was surely licking his chops coming into this game, going up against Bears RT Bobby Massie, who has struggled in the past against pass-rushers. He found success in his 21 pass-rush snaps against Massie, racking up three total pressures for a pass-rush productivity (PRP) of 10.7. Hunters four total pressures on the evening brings his season total to 16. Trubisky had a good first half in his rookie debut, going into the third quarter with a positive grade. 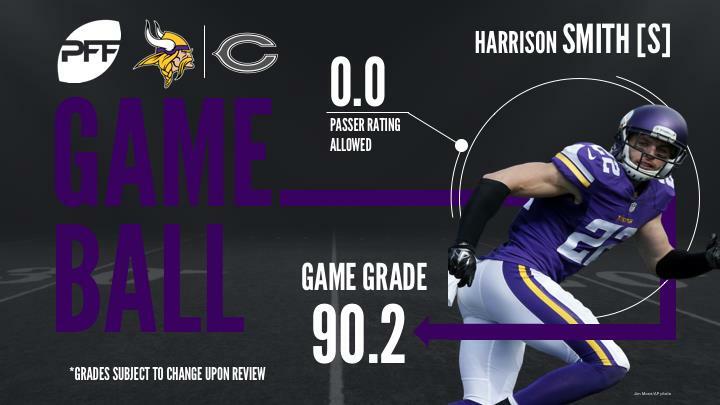 The second half was different, as he and his receivers didn’t look in-sync on some occasions, and then the interception made by Harrison Smith sealed the Bears fate. As expected of most rookie quarterbacks, Trubisky struggled under pressure, going 1-of-7 for only 9 yards on nine dropbacks. He can expect to be blitzed often by opposing coordinators going forward and how he copes with that will play a large role in his success this year. Wright was Trubisky’s favorite target on the night, as he caught four of the five passes thrown his way for 46 yards. Wright caught two passes each against Trae Waynes and veteran Terence Newman, as they were the primary defenders on him throughout the game. Wright’s five targets tonight brings his total to 23 on the season, he has caught 18 of those with two dropped passes. He’ll play an important role with Trubisky taking the reigns, as the two will hope to develop chemistry going forward. Hicks was an absolute beast for the Bears defense, as he manhandled the Vikings offensive line all game long. Hicks finished the game with two sacks and two hurries when rushing the passer, but that wasn’t the most impressive part. Hicks almost single-handedly destroyed the Vikings rushing attack, as he made three solo run stops, blew up countless points of attack, and finished with a game-high 94.1 run defense grade. After struggling in his first three games of his sophomore season, Floyd has impressed in these last two. Against the Vikings he racked up two sacks (one for a safety), a quarterback hit, and there were a couple of times where he beat his man but couldn’t record a pressure. His pass-rush productivity score of 10.2 ranked 11th this week among outside linebackers. Floyd was also effective against the run, as he made three solo stops.